It’s been a little bit since I let you all know how our house fund is going, so I thought I’d do an update today. That’s honestly not bad. I’m pretty happy with the numbers as they’re commensurate with where we ideally want to be on our timeline. But I know it’s not going to stay that way. I have a variable income at work. The worst months for it are over the summer while the best months are coming to a close. In the blogging world, the summer months are typically the slowest, as well. In fact, May was the absolute slowest month I’ve had with income on this blog in over a year. Traffic has still been steady, but the money just hasn’t been coming in at the same rate. Even though I knew it was coming, it was still a little bit of a shock to the system. Writing, on the other hand, has been going pretty well. If you need or know anyone who needs a staff writer, please send my name along! This aspect of working online has been a lifeline, and I’m glad it’s work I enjoy doing. Unless I can really build up writing a little more, I don’t think we’ll be able to contribute to the house fund again until fall. I’ve added up our numbers, and we have enough to make it through July without tapping into the house fund. I’m planning on having a bit of additional income to make it through August and September, as well, but nothing’s in stone yet. Once I have those two months covered, anything additional will be going towards the house. I’m not sure if there will be anything additional. At this point, making it through the summer without touching savings will be a huge psychological win. But I really want to try. I want to prove to myself that I can do this. I also want to start automating Pinterest. Because I’m spending way too much time on there. Does anyone have any solid recommendations for that? I’m not above spending $5-$10 a month to do it. But I’ve seen so many reviews for so many services that I’m not really sure which direction to go. How is your side income going lately? How about progress on your financial goals? 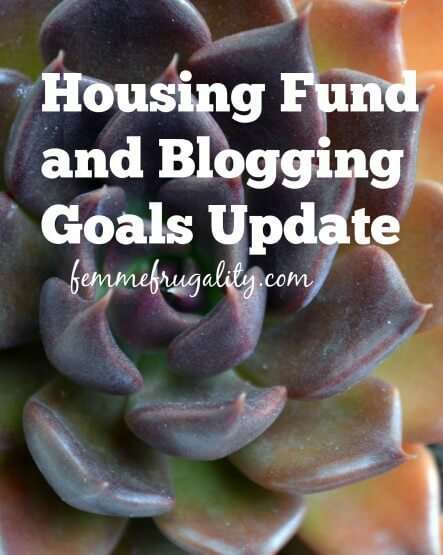 This entry was posted in Ways to Save Money on June 1, 2015 by femmefrugality. I love to hear that you a plan for your home. As for Pinterest and traffic I’m going to email you. Got it! Give me a little bit, but I’m definitely going to pick your brain! Yeah. I’ve known it was coming, too. Honestly, we need it. We work too hard for our health nine months out of the year. So while the summer’s aren’t great for the pocketbook, they’re good for just about everything else in our lives. Glad to hear I’m not alone in the initial struggle, though! Was saving up for investment properties easier? If so, what made it that way? I wonder if that pans out in real life. Worth asking! Thanks, Kay! Been at it so long I don’t know how to go without! I imagine the break is good for mental health! Summer slow downs are no fun. 🙁 I’ve never heard of automating Pinterest before! Interesting! I hope you manage to get some side gigs coming up so you can keep contributing to your fund! I think the fact that you’re incoporating an emergency fund into your house fund is a great idea. I hope you can get through summer without dipping in! Sounds like you will as you’ve got plans in place to cover you. Blog income has been slow for me over the last couple of months too. Let’s hope we see a rise in the autumn. Re Pinterest, I’m using Boardbooster, it’s really easy to use which is what I like about it! I hope things pick up soon for you and that you are able to contribute to your house fund again soon. Now for the Pinterest automation…I’m reading your comments! Have a great day! Last month was a rough month, but we are still making progress. Diversifying your income sources is a good plan. Hope the summer is good for your health and happiness, if not your budget! It’s so smart that you’re including the emergency fund in your savings as lenders will look for that! And check out the post we just wrote, about how things are tough early on, but get better quickly over time. Have a great weekend! Congrats on doing so well with your blog! I hope it picks up a little in the summer. I actually found last month to be pretty solid for mine – but I don’t have very high goals for it.